The hilltop village of Gattières is known as one of the most picturesque of the Alpes-Maritimes department in France. 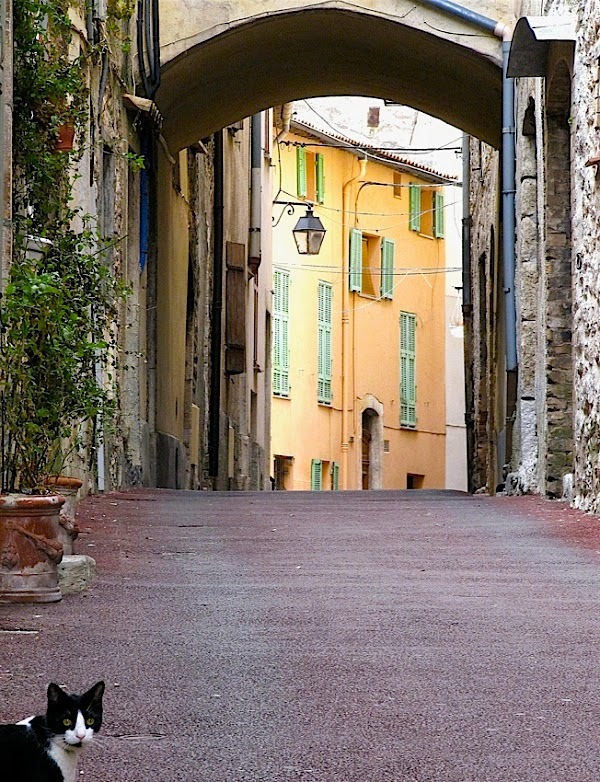 But it becomes even more beautiful with this tuxedo cat roaming its medieval roads. Similar pictures here, here, and here. Mum says that is "so France"! Beautiful! I sure hope no one surrenders to the invading cat. I kid, I kid. France actually has a great military record and has beaten us more than their fair share. That B&W kitty stands out with such a colorful background. Love the first one. Have a marvellous Monday. We wonder where that kitty is going. A beautiful place but the cat makes it perfect! Nice place and beautiful cat! Beautiful cat. I have a tuxedo cat, though, so I might just be biased. I'd love to be walking down that street too. Beautiful. How lovely. And he is the only one out. I love the buildings, especially the yellow with green shutters. Wonder if he belongs to someone. I like these buildings. The cat seemed to be waiting for you to follow him? All the colors and the structures are gigantic compared to the cat right there amongst everything. That is such a cute little Tuxie! Hey! Where are you going sweetcat?! Let me give you a huuuuuuge hug! The cat looks like he's saying, "Well, are you coming or not?" I'm so jealous of that feline. Vanessa, I love this cat, and he looks just like my Romeo (my cat's name). My cat has the same colourings and markings. :) Beautiful photos. That is just stunning! I love the brightly painted buildings! So beautiful! Your photo has so much charm! Love photos of cats in their worlds! Ah I would just love to go there! Cats are amazing little creatures with all their own personalities. I enjoy your photos each week. Beautiful photos! Thanks for linking on Amanda's Books and More. Lovely cat. I love how he is offset in the first photo! J'aime beaucoup les petits villages ... du département que j'habite ! 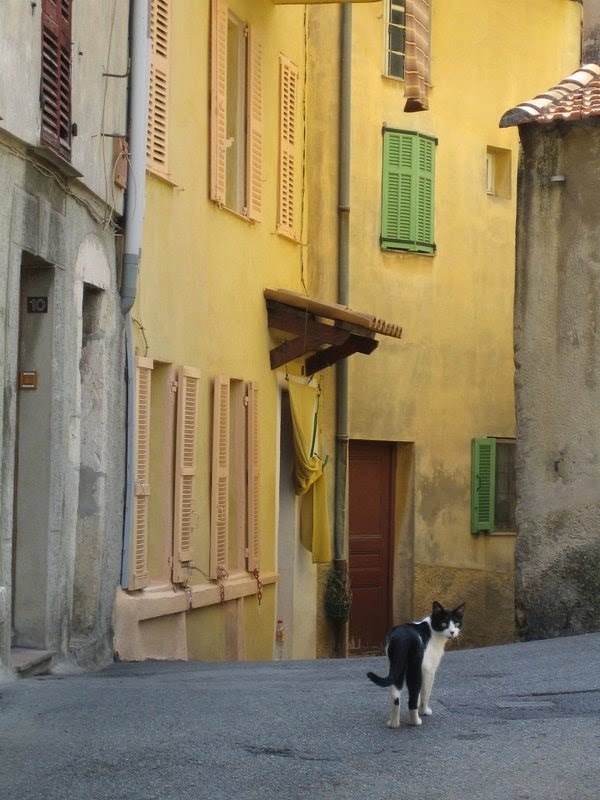 Des dédales de rues qui montent, des vieilles maisons colorées ou en pierre, des fleurs un peu partout et toujours des chats. I feel like that kitty is callin' to me, askin' me to follow him. What amazin' pictures. The cat owns France. Such pretty photos! Very nice pictures, love the view!! Fabulous photos. Love the architecture of the buildings! A picturesque place for a kitty to call home. I love cats! Thanks for sharing on OMHG Wordless Wednesday! The scenery and kitty - both beautiful! The photos are amazing and the kitties are so adorable. I would love to move to one of those house and adopt the adorable cat! He could be our Mandrake's brother!